The second day of archaeology at South Adger’s Wharf started with a frosty chill, but the cool weather didn’t dampen the anticipation and excitement in the air. The second trench, opened on Thursday afternoon, was widened and lengthened in the hopes of encountering some remnants of the brick redan that was started in 1696 and demolished in 1785. At approximately 11:45 a.m., an excited cheer rang out from the site, signaling that something truly interesting had been found. After seeing large numbers of paving bricks from the nineteenth century yesterday, the crew uncovered a large mass of bricks and mortar that appeared to be part of something much more substantial. 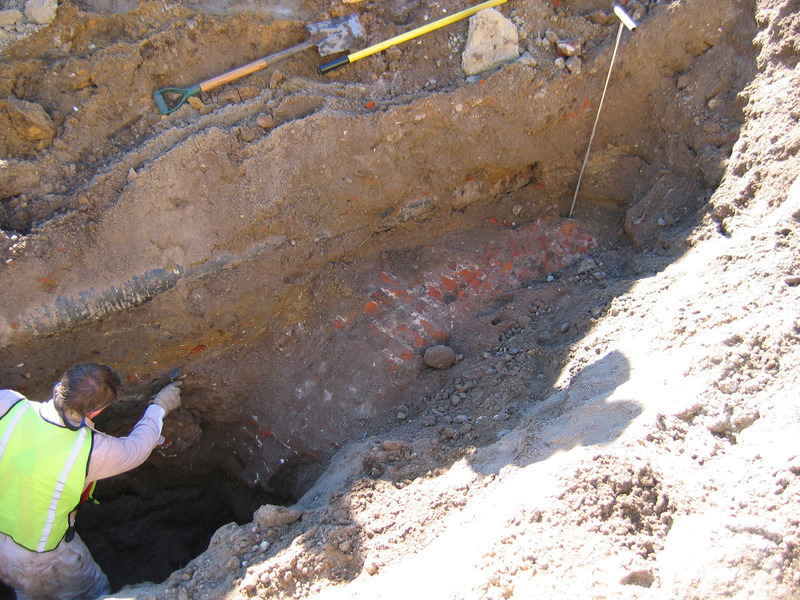 Members of the Mayor’s Walled City Task Force all agreed that this brick mass was likely part of the south flank of the salient angle or redan that projected outward from colonial Charleston’s eastern curtain line, but there are still several lingering questions about its precise identity. 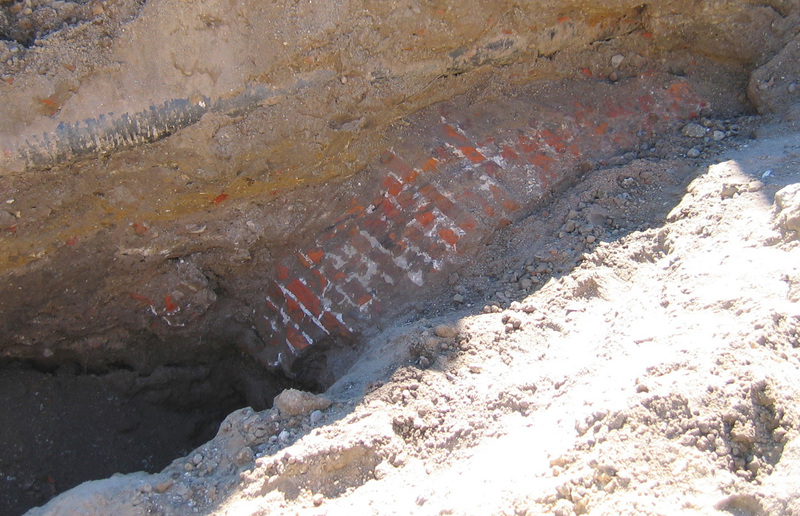 The location of this brick mass, which is laid in English bond, seems to match that indicated by eighteenth-century plats of the site, but none of the visible surfaces appear to represent an original finished face or exterior surface. 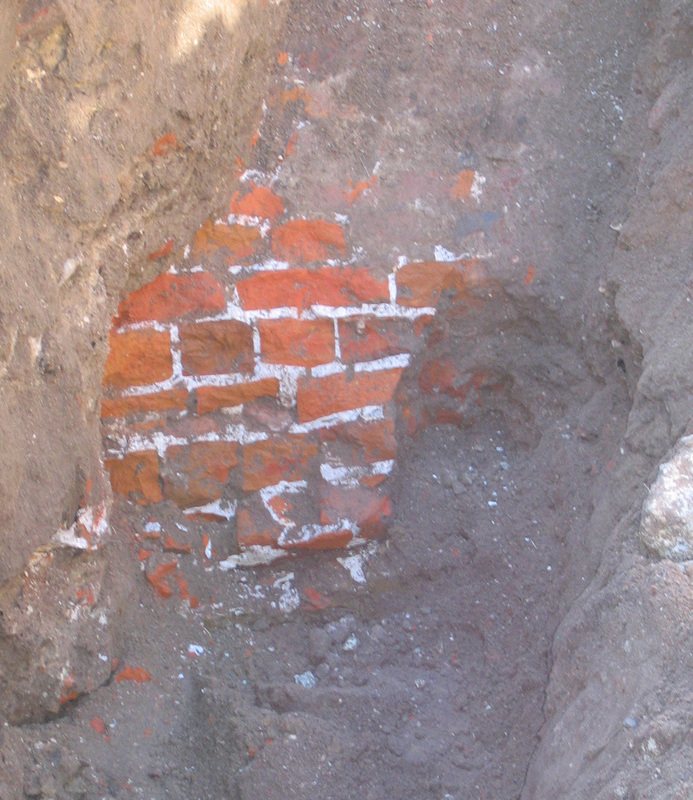 The demolition of the redan in 1785 undoubtedly left scars on the surviving remnants, and there is ample brick rubble surrounding this feature to emphasize that point. On Monday we’ll have a chance to explore the area around (and below) this mass of bricks, the 1696 foundation of which should be especially interesting. Hopefully by Tuesday we’ll have a more confident opinion exactly what we’ve found. If you’re interested in volunteering a few hours of your time to screen dirt for artifacts or to help interpret the site for passing foot traffic, please contact Katherine Saunders at (843) 723-3646, or email her at ksaunders[at]historiccharleston.org.